March 3, 2016 By wplogan in Outdoors, Two Rivers Events, Uncategorized Comments Off on Where and When do Innkeepers go on Vacation? Where and When do Innkeepers go on Vacation? This is a question I often get from our guests. Since summer is our busy time, we usually try to get away in the winter time – always seeking out a warm and sunny climate. 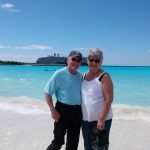 We just returned from this year’s vacation, which was a cruise to the Eastern Caribbean on the Holland America ship the Westerdam. We visited the Grand Turks islands first. We sat on the beach, soaked up the sun, and admired the beautiful blue water of the Caribbean. From there we docked at San Juan, Puerto Rico and walked the “Old Town”. The next port was St. Thomas. There we took an excursion where we kayaked the mangrove lagoons, hiked the wildlife preserve, and snorkeled a marine sanctuary. Then on Saturday, when we got off the ship, we had time to kill before our flight. We took a bike tour with the Bumble Bee Bike Tours of Ft. Lauderdale, the “Venice of Florida” and saw Las Olas Blvd., the New River walkway, and the high rent neighborhoods with the mega yacht. We had a beautiful weather the whole trip and came back rested and renewed. 2. Enjoy our beautiful beach at Neshotah Park in Two Rivers. It’s the place to be on a hot summer day. 3. Stroll through our downtowns and enjoy our local history museums. The Historic Washington House, The Hamilton Woodtype Museum, Rahr West Art Museum, and the Wisconsin Maritime Museum. 4. Rent kayaks and paddle the East & West Twin Rivers or the Manitowoc River. Rentals are available at Shipwreck Adventures (www.shipwreckadventures.com) in Two Rivers or the Manitowoc Marina (www.manitowoc-marina.com) in Manitowoc. Sample a taste of our own Eco Tourism! 5. Rent bikes and explore the Mariners Trail and the Rawley Point Trail. Enjoy the scenic views of Lake Michign and Point Beach State Park.